Aveeno Repairing CICA Hand Mask - 1 pair - $4.99 - restores balance and essential moisture to dry hands leaving them smoother and softer in just 10 minutes. 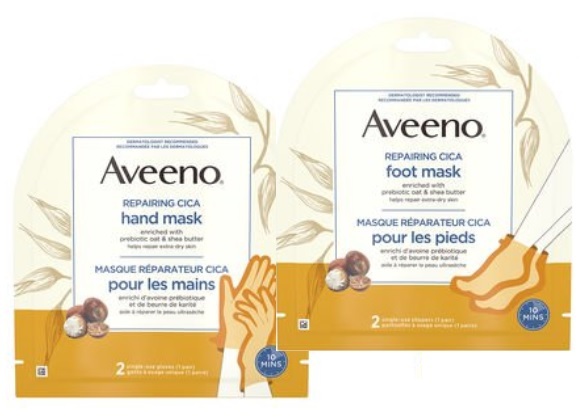 Aveeno Repairing CICA Foot Mask - 1 pair - $4.49 - intensely moisturizes and helps repair problem skin. Both have a paraben and fragrance-free formula enriched with shea butter and prebiotic oat that is gentle enough for dry, sensitive skin and are super easy to use. Just wash hands and/or feet thoroughly, insert hand/feet into glove/slipper, leave on for 10 minutes and remove - no need to rinse, just massage any excess product into the skin. And if your hands/feet are especially dry go ahead and leave the glove/slipper on longer - the formula doesn't have any peeling aspect to it, just straight moisture, so it doesn't hurt to let the moisture soak in for as long as you like!